I knew a party on wheels would appeal to my group of friends, so I assembled a crew for my maiden voyage on the Pints and Pedals party bike. Armed with a cooler of beer (cans allowed for sipping between stops), and my music playlist ready, we headed for what would hope to be a fun night out on this 15 passenger pedal bar experience. The night was made for us, as it was a cool night in August – perfect for pedaling. We climb into the adjustable, cushioned back seats and stow our belongings on the shelf above our heads, complete with LED lighting. With my red solo cup in its holder, I’m officially ready. After a brief safety speech from our driver, we plug our iPhone into the bike’s sound system and start pedaling. 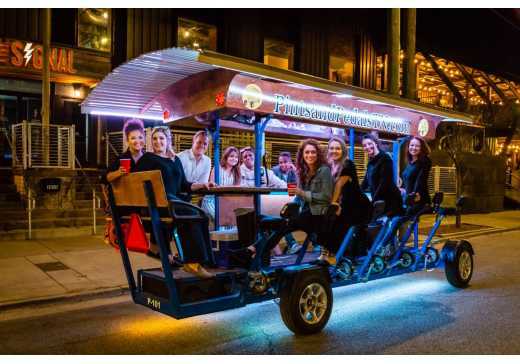 The Pints and Pedals crew has negotiated drink specials at several bars around town, but they’ll steer wherever you say. According to the trusty tour guides, the most popular area to pedal to right now is the Southside. We couldn’t agree more, and jumped at the chance to cruise the Southside route. Along the way, one of the first things I realized about the tour is (1) pedaling is really easy, (2) everyone loves a bar on wheels, and (3) is that a subwoofer? We would have to agree the stereo and light show is definitely awesome. We were greeted on every street corner with smiles and waves with some people even dancing along with us on the sidewalks. As we round Market Street, we cruise down the road in front of Urban Stack and park just in front of the side bar entrance. Urban Stack is just one of those classic Chattanooga places that has something for everyone. The bartender was a little busy when our group of 15 came in to say the least, but we grab our drinks, ask for our tab, and quickly head back to the bike for round 2. Back in the saddle, we pedal down side streets to get to Chattanooga Brewing Company. The classic brew pub, which has just undergone an extensive renovation to include an outdoor beer garden, is a perfect stop to keep the fun going. A Chattanooga Football Club game was going on across the street and the whole atmosphere was really buzzing that night – which made our tour even more exciting. The very first Pints and Pedals tour was a bachelor party, but they’ve hosted everything from book clubs to family reunions. While you can rent the entire bike, it’s almost more fun to take your chances with a mixed crowd. The guides have seen people do the tour first thing, exchange numbers, then and hang out the rest of the weekend. For our final stop, we pedal down to Chattanooga’s newest entertainment area, Station Street. On Station Street, you can find The Terminal BrewHouse, STIR, American Draft, Backstage Bar, Regan’s Place, and Westbound Bar – just to name a few. Fun and laughter is all you will find here, and Pints and Pedals definitely doesn’t go unnoticed. Everyone was cheering us on like we we’re rock stars jamming out to our favorite songs – and to that truth I guess we were! As we pedal back to our car, we ask the owner about future plans for the party on wheels. We certainly had a blast on Pints and Pedals and look forward to all the upgrades soon to come. For more information, check out Pints and Pedals at PintsandPedalsTN.com or check them out on Instagram here.